The Casino War is without doubt the simplest card game available in the casino, but its simplicity doesn�t make it less interesting. If as a kid or teenager, you ever played War or placed bet on the highest card value, then the Casino War will seem immediately enjoyable and familiar. Six decks of cards (without the jokers) are played in this game. Cards are ranked according to their poker value with a king outranking a queen, and Aces being the highest. A side bet referred to as "Tie Bet" can be played simultaneously, but you can�t play on the Tie Bet alone. All suits of cards (hearts, spades, clubs and diamonds) are of equal ranking. After all players have placed their bets, all players and the dealer, each gets a card. These cards will be compared with the dealer’s card. If the player's card is higher, he wins and grabs the cash. If the dealer’s card is higher, the player loses. Really simple, right? In the event of a tie, the player has two choices: the first is to surrender and give up half the bet or the second go to war with the dealer. If a player decides to join the casino war, he needs to raise the bet by an amount comparable his earlier wager. The dealer repeats this step but this is simply just for show. The dealer burns three cards and the player gets one card and the dealer also gets a card. If the player’s second card comparable or beats the dealer’s card then the player wins equal money on the raise only, while the original bet is a push (neither win or lose). But if the dealer’s second card has higher value than the player’s card, the player loses both bets. Tie bet also applies in certain casinos which pay ten to one if the first two-cards tie. So, you may ask about the house edge lay in the game? While, the winning probability is fifty percent, the advantage comes from the "spoil of war", where you either lose one unit or win two. For example, when you previously bet five dollars you must double the bet, risking ten dollars only to win five dollars in return. Casino War is a casino card game but one that could be played easily by any person familiar with bets on drawing the highest card. 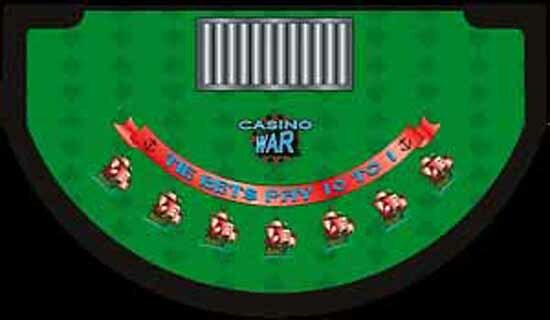 Casino War is based on the "War" game played by children. Even though playing it is easy, you should not forget that the casino house would be having a very big edge over you, compared to other casino games. If you are new to the game, we advise you to start off with moderate amounts until you get fully familiarized with it. The dealer and the player get one card each. If the player gets a higher card, the bet is won and an equal amount (2:1) of the bet is handed over to the player. If the dealer gets a higher card, the player would stand to lose the bet. If the player and the dealer have cards with the same ranking, then it is termed as a tie. In such a situation, the player could opt to surrender and lose half the bet. Otherwise, the player could declare war and place an additional bet (raise bet) that has to be of the same amount as the original bet. If War were declared, then the dealer would discard three cards before dealing with additional cards to the player and the dealer. If the player gets a higher rank card, then the player would be a push (money returned to you with no win or loss) on his original bet and he would win even money (2:1) on the raise bet. If the dealer receives a higher ranked card, then the player would lose the original bet amount and also raise bet. Some casinos offer bonus in case a tie results in another tie. The bonus usually equals to the amount of the original wager. Now, over to some good Casino War strategies that you may implement when you play the game. If you and the dealer are dealt two similar cards (a tie), always go to War and never surrender. Even though you surrender, you are still going to lose half your bet (don't let the house win if you don"t have to!). Although surrendering may seem to be the safest option at first, it is better to risk twice your bet in hope of winning your first bet (2.33% house advantage) than it is to give up your first bet without a fight (3.7% house advantage). Work the odds out for yourself and you will see that your odds of coming out ahead are higher when you don't surrender. As always in gambling, there are elements of luck and risk involved. Remember, you can�t win anything if you don't gamble. Just like the classic card game Black Jack, the Ace is regarded the highest and therefore the best card. Keep a close eye on the Aces and how many times they�ve been played. Then you can calculate the probability of an Ace turning up. Several casinos offer an optional side bet referred to the Tie Bet. This bet is independent of your bet that you place for the actual Casino War game. If you and the dealer are initially dealt two identical cards then you automatically win 10 times (10:1) the amount you bet. So if you win it could be quite rewarding. The odds are against you when playing the Tie Bet. Statistics show that the casino has huge house advantage of 18.65%. For this reason, it�s advisable that you stay away from the Tie Bet. If you still want to wager on it, you should only do it on few occasions as added excitement or fun when you feel a tie is bound to happen. Just don't use the Tie Bet as your main strategy to win money. Statistical experts had calculated the percentage of edge the casino house possesses in Casino War game. Normally, Casino War is always played with 6 decks and with a bonus for a tie. Both the player and dealer have 50 % chance of winning on the 1st card if it�s played using 6 decks. If it is a tie, then the house has an advantage. The following statistical table might help you understand the exact percentage of edge the casino has over the player in Casino War. From the above table, it is clear that the advantage always lies with the casino house in Casino War. Under regular rules, the Casino War House Advantage is 2.33%. The "Without Bonus" and "With Bonus" columns refer to when there is a tie. Start off with moderate amounts if you are new to the game. Don't wager on the side bet Tie Bet as a part of your core winning strategy for this game, but rather use it to add some extra excitement to the game. ALWAYS go to War and never surrender since the odds will play in your favor. Finally, play responsible and only use reputable online casinos.